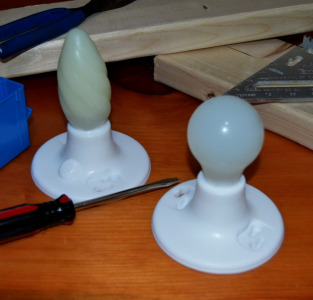 Bring some light to where the sun doesn't shine with our silicone light bulb and fixture! They glow bright green in the dark, providing the perfect ambiance for a late-night romp. Plus, they're safer than candles - if you get a bit rough and knock them off the headboard, they won't light your bedroom on fire. For those more adventurous, you can find creative ways to turn out the light. Our brightest idea ever! Available in standard and torpedo style bulbs. Total Height (Twisty Torpedo): 5¾"